The University of Notre Dame will launch a master’s of science in global health degree program this fall. The program will provide basic science-centric training in the emerging field of global health. The program, including classroom and experiential learning, aims to prepare students for improving human health around the world, especially for the poor and under-served, a reflection of the University’s Catholic mission. The master’s degree builds on the extensive global health-related science research and training already conducted at the University of Notre Dame through the Eck Institute for Global Health. Students will receive hands-on research, training and service experiences in resource-poor settings that lack basic health resources and services. Through the program, students will receive a professional master’s of science in global health in one calendar year, including course work in bioethics and global health challenges and 6 to 8 weeks field experience. Electives include courses on AIDS, parasitology, human disease, population and disease ecology and medical microbiology. Joseph Bock, director of external relations at the Kroc Institute for International Peace Studies since 2007, will oversee the new program as director of global health studies at the Eck Institute. 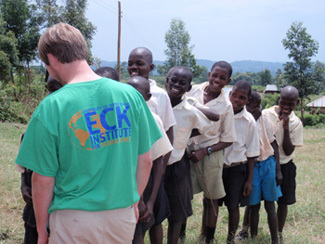 Bock, a former Missouri state legislator, has been the University’s liaison to Catholic Relief Services and is a member of the working group on Water for Life of the Eck Institute for Global Health. He brings years of practical experience in global health from South Asia, the Middle East, Africa, Eastern Europe and, most recently, Haiti. 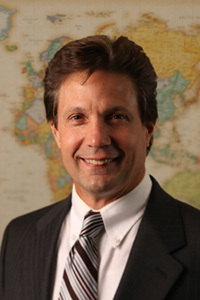 Bock supported the work of the Notre Dame Haiti Program and met with numerous U.N. officials while he served as Interim Country Director in Haiti for disaster recovery with the American Refugee Committee during March and April of 2010. Including cash for work employees, he built a team of more than 300 people working in four displacement camps. He is an editorial adviser for Development in Practice, a peer-reviewed journal founded by Oxfam Great Britain offering practice-based analysis and research on development and humanitarianism. The master’s program will start with six students and is anticipated to grow to 12 to 25 students, with its curriculum eventually involving collaborations with the College of Engineering, the College of Arts and Letters, the Law School, and the Mendoza College of Business. Only three similar programs operate in the United States, and student demand is beyond their capacity. The Notre Dame program brings a unique focus on basic science, health and the poor. Applications are being accepted on a rolling basis. More information about the program is available here. Originally published by Marissa Gebhard at newsinfo.nd.edu on January 06, 2011.